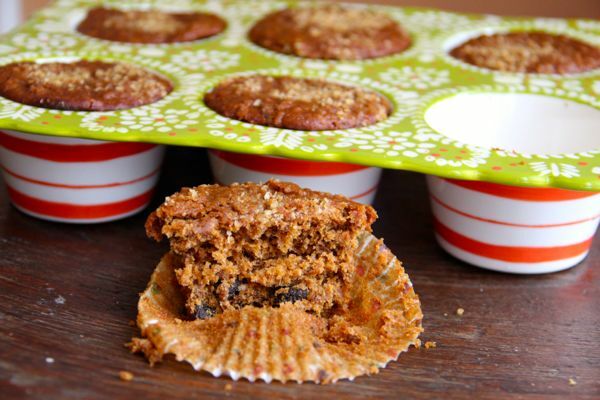 Start your morning right with these healthier bran muffins. Do you ever crave bran muffins? I do. I was meeting a friend for coffee last week and I was getting ready to order when I saw a gorgeous bran muffin staring back at me. I often avoid them in bakeries as they are one of those foods that look and sound healthy but can pack in the calories. In fact, this particular Honey Bran Raisin Muffin I ordered (and shared) was 440 calories! Many donuts at this same place were lower in calories than the bran muffin! This recipe for bran muffins uses molasses to add a lovely deep color. Honey was used instead of refined sugar and whole wheat pastry flour was used in place of regular flour. Bran is rich in fiber, vitamins, minerals and phytonutrients. Raisins contain fiber, vitamin B6, iron, magnesium and calcium. They are also are rich in antioxidants. Preheat the oven to 350*. Spray a muffin tin with nonstick cooking spray or use paper muffin liners. Mix together the bran cereal, baking soda and buttermilk, and let stand for 10 minutes. In a large bowl, mix together egg, coconut oil, molasses, honey, orange zest and vanilla, then beat in bran mixture. In a small bowl, stir together the whole-wheat pastry flour, baking powder, cinnamon and salt. Stir into the bran mixture until just blended. Fold in the raisins. Scoop into muffin cups filling each cup 3/4 full. Bake in preheated oven for 20-22 minutes, or until tops are deeply golden and they spring back when lightly tapped.